, earl of Pembroke, was born at Wilton in Wiltshire, April 8, 1580, and admitted of Newcollege in Oxford in 1592, where he continued about two | years. In 1601, he succeeded to his father’s honours and estate; was made knight of the garter in 1604; and governor of Portsmouth six years after. In 1626 he was elected chancellor of the university of Oxford, and about the same time made lord steward of the king’s houshold. He died suddenly at his house called Baynard’s-castle, in London, April 10, 1630; according, as Wood foolishly says, to the calculation of his nativity, made several years before by Mr. Thomas Allen, of Gloucester-hall. Clarendon, however, seriously relates, concerning this calculation, that some considerable persons connected with lord Pembroke being met at Maidenhead, one of them at supper drank a health to the lord steward: upon which another said, that he believed his lordship was at that time very merry; for he had now outlived the day, which it had been prognosticated upon his nativity he would not outlive; but he had done it now, for that was his birth-day, which had completed his age to fifty years. The next morning, however, they received the news of his death. 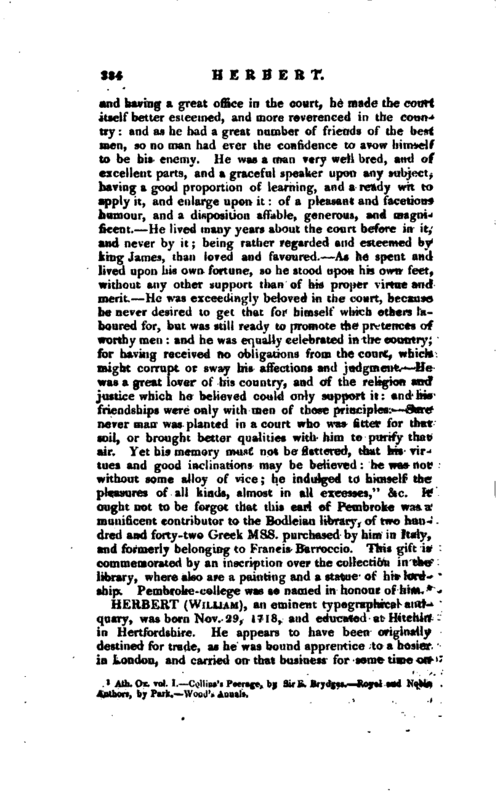 Mr. Park remarks that had his lordship possessed a credulous mind, it might have been suspected that this astrological prediction had worked upon his feelings, and occasioned a temporary suspension of the animal faculties, which was too hastily concluded to be dissolution; for Mr. Granger states it as an accredited fact in the Pembroke family, that when his lordship’s body was opened in order to be embalmed, he was observed, immediately after the incision was made, to lift up his hand. 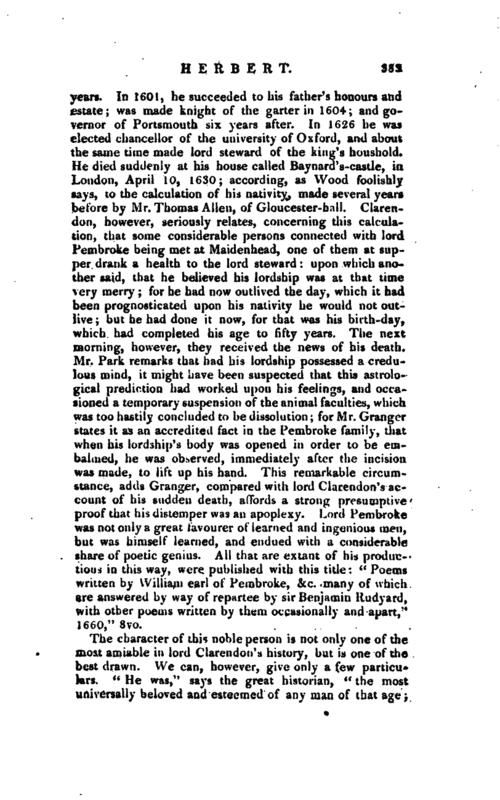 This remarkable circumstance, adds Granger, compared with lord Clarendon’s account of his sudden death, affords a strong presumptive proof that his distemper was an apoplexy. Lord Pembroke was not only a great favourer of learned and ingenious men, but was himself learned, and endued with a considerable share of poetic genius. All that are extant of his productions in this way, were published with this title: “Poems written by William earl of Pembroke, &c. many of which are answered by way pf repartee by sir Benjamin Rudyard, with other poems written by them occasionally and apart,” 1660," 8vo. Ath. Ox. vol. 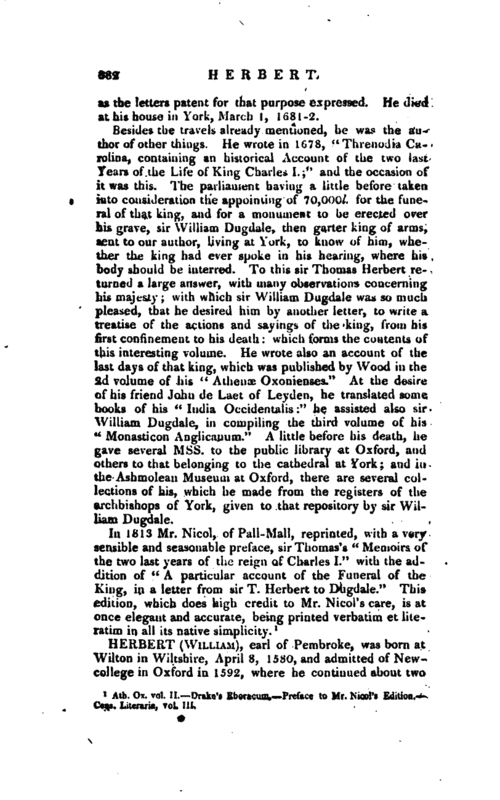 I. Collins’s Peerage, by Sir E. Brydges. Royal and Noble Authors, by Park. Wood’s Annals.